I'm frugal. That's the best, easiest way to say it. I hate to spend money, and weddings these days cost more than cars. I did as much as possible DIY to save money, and wanted to share some simple DIY projects I used for our wedding. Feel free to use or tweak these ideas to work for you, and enlist your bridal party to help as much as possible to save time! When trying to decide what to use as tossers, I had a lot to take into consideration. A lot of items were banned, since our wedding/reception was in a state park. We weren't permitted to use confetti, pompoms, or rice, and since we had a day wedding, sparklers weren't practical. I considered using bird seeds and corn (for deer), but wasn't sure how pretty that would appear in pictures. So, we ended up going with lavender. I bought small linen bags in bulk on ebay, and purchased a pound of lavender from an independent seller (also on ebay). I stuffed each bag with an index card folded in half (to prevent bleed-through) and hand-wrote "toss me" on each bag with a sharpie. I kept to the berry-colored theme, sticking with pinks, purples, and grays. Once the bags were dry, I filled the bags with two teaspoons of lavender a piece. The bags were tied with an easy-pull loop. Bonus: We kept the leftover bags as fresheners throughout the home, in the closet and drawers. Signs were an big, important part of the wedding since we didn't have a coordinator, or have someone to direct guests here and there. 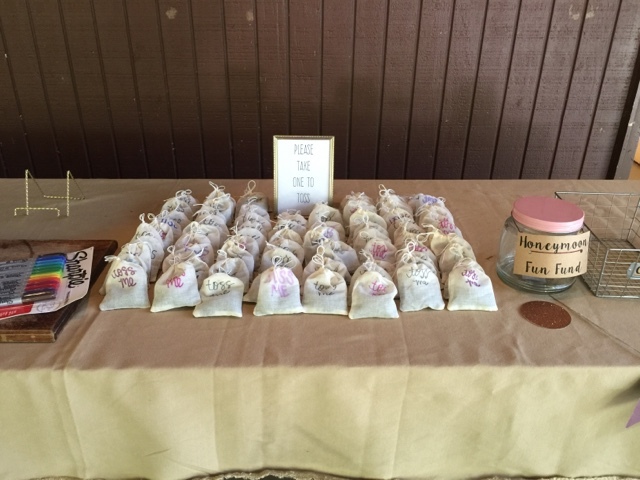 We made sure to label all desserts and drinks for ease, as well as a tip jar, a place for cards, and favors. I took the easiest road possible with these things. 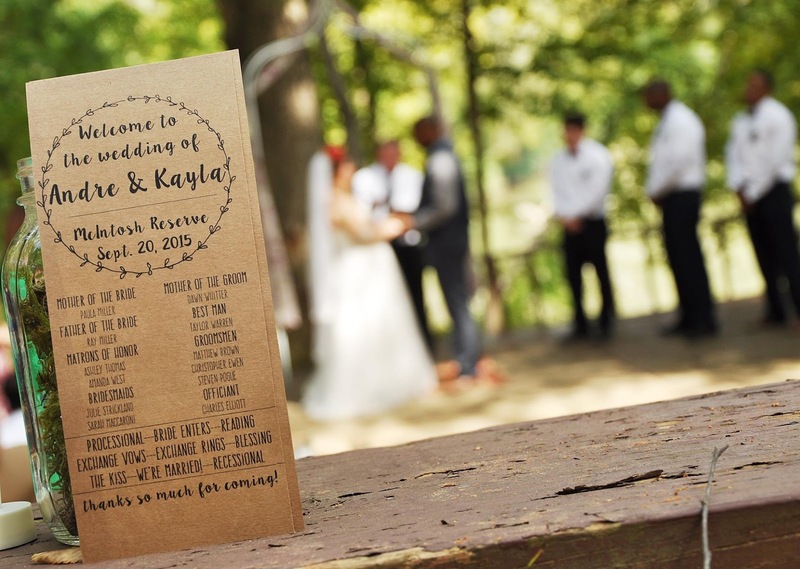 All small signs were typed up in Word using a pretty, free font (I used Lilly Belle) and printed on kraft paper cardstock. Most printers will print on thick cardstock, however the paper settings may need to be changed. Printings were cut to size and adjusted accordingly. 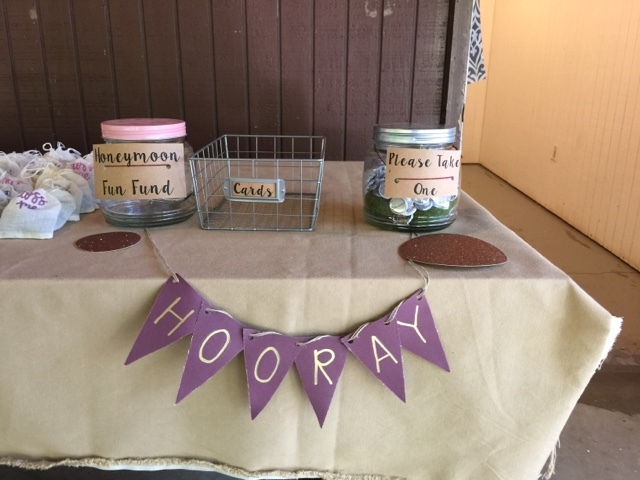 For example, the "Honeymoon Fun Fund" and "Please Take One" favor signs (see below) were hole-punched on either side and strung through with embroidery thread. The same was done for each of the drink jars. Additionally, we featured a dessert bar instead of full meals, and each pie or dessert was labeled with a flag. These were also printed out on cardstock, cut down to about 3 inches a piece, taped to toothpicks and stuck into the top of the pie. Voila. Easy peasy. As for the large signage (seating, parking, etc. ), I collected any pieces of smooth wood that I could. Most of these were additional pieces to shelving or entertainment centers picked up from yard sales and the like. I spray painted the signs burgundy, and once dry, wrote on them in script with a paint marker. Fair warning: practice, practice, practice before writing on your signage in paint. We used tablecloths in neutrals for the gift table and the food and drink tables, but other tables we placed a simple centerpiece and left it at that. I picked up several gold/brass candlesticks around thrift shops and yard sales and used those as centerpieces, along with clumps of moss and pinecones. For the dessert table, I bought several mix and match cake stands, once again buying cheaply from thrift stores and yard sales, and spray painted them all gold for one solidified, uniform look. You can find the directions for making a pennant banner here. Programs were fairly simple. The most difficult part was choosing a design. I scored Pinterest for free wreath graphics, then used Paint to make a simple design. Once again, I used the free Lilly Belle font, but this time, I mixed with Frente H1. I lined up the design three times, and printed on kraft paper cardstock, and used a paper cutter to slice them evenly. PS. If you're having a more whimsical or rustic wedding, it is okay if the programs are cut a little uneven or not at the perfect size! This adds to the feel of the wedding. So many people were shocked to find that I was using faux florals in my bouquets and boutinerres. I figured if I was going to spend so much money on flowers, I should be able to keep them forever, right? I kept an eye out for sales at Hobby Lobby, and only purchased florals when they were half off or more. I spent around $80 for all flowers, including my bouquet, the toss bouquet, my headpiece, bridal party, and boutinerres for all the men and parents. Basically, this is a trial and error and placing all florals together. Once I found a look I really liked, I tied all the flowers together with embroidery thread, and had my dad cut the stems even with a wire cutter. Voila! Florals. 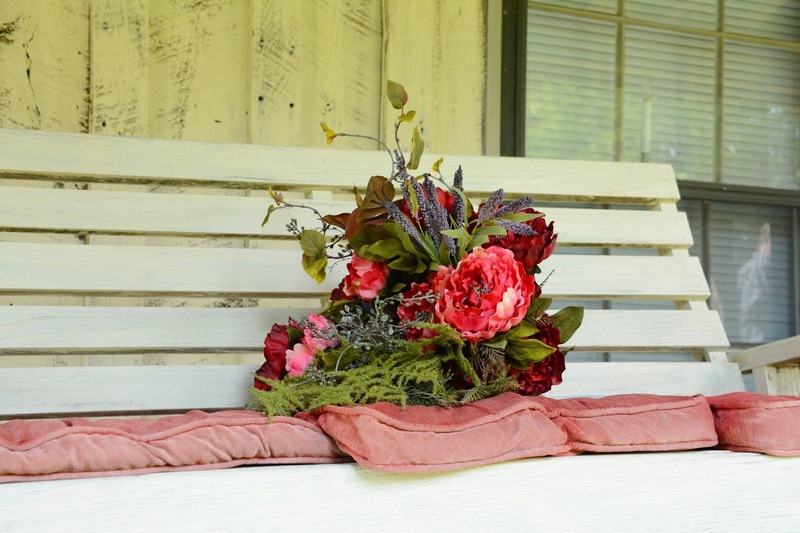 Bonus: I can keep my bouquet as home decor for the rest of forever! 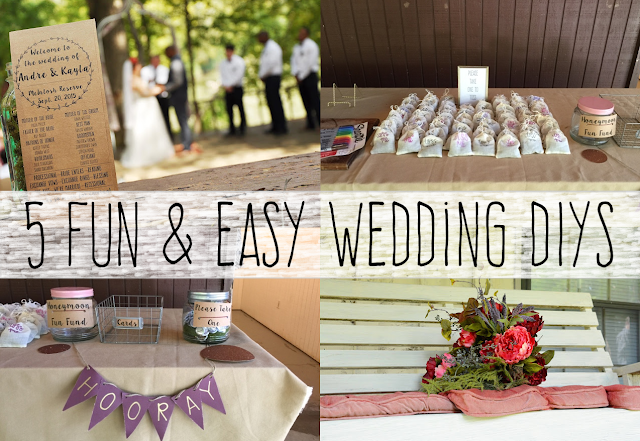 What were you favorite DIYs for your wedding? Oh, absolutely, Trish! Any of these can be tailored to whichever kind of party, especially the banners!